Although I have lived in some of the country’s barbecue meccas such as Oklahoma City and Austin, I have only recently been on a quest to purposely seek out the best barbecue, catalog it, and really enjoy what they have compared to large parts of the country which are lacking in such amenities. Just like in Oklahoma and Austin, though, I took it for granted that El Paso also had great barbecue. 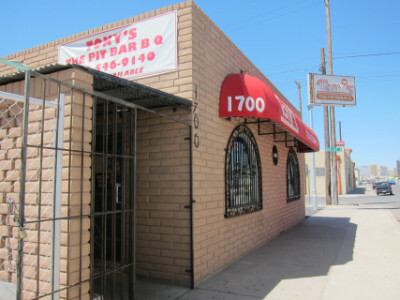 Today I no longer assume that good barbecue will be everywhere, but I do appreciate the fact that Tony’s Bar-B-Q is still going strong. Open since 1958, it has primarily served the downtown lunch crowd by specializing in sandwiches and barbecue plates that are just the right size for this time of day. Located just off of Interstate 10, though, it also makes a good stop for those who are just passing through. I think that the brisket sandwich is really the thing to order, and I was reminded recently that it is really difficult to get brisket this good outside of Austin. There are several aspects of Tony’s that for me fall short of what I expect in a good barbecue restaurant, but the brisket is seriously some of the best you will find anywhere. When you approach the counter you get to look at the choices before you order, and a menu board also lets you know about any specials. On my last visit they had a special for ribs and a brisket sandwich, along with a side order and drink. This seriously makes a better meal for two persons than one, which was an excellent choice for my dining partner and I.
I think the Brisket Sandwich is not only the best item here, but along with a side dish is really the perfect size for lunch. I have to confess that we ordered an extra sandwich so that each of us would have our own, but sharing a half sandwich along with some ribs is not bad either. 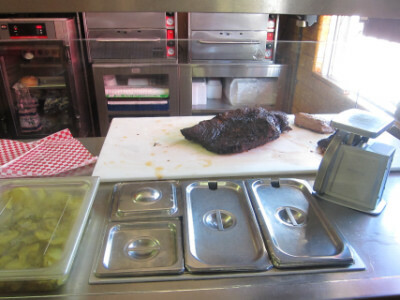 The brisket was tender and had an excellent flavor–they cover all the points of having good meat and cooking it the right way. Brisket is sub-par in so many barbecue restaurants (even otherwise good ones) that I think it is important to take advantage of the ones that are as good as Tony’s. To me the Ribs were somewhat disappointing compared to the ones in Oklahoma, as much so as the brisket in Oklahoma is disappointing compared to Tony’s. The ribs are still excellent and is cooked to the right texture with a good sauce, but for some reason I found the flavor a little lacking. The sauce at Tony’s is less sweet than in Oklahoma and less robust, but I still found it to be good. I believe the barbecue is cooked according to the methods used in Austin, and I know that in Austin the sauce is really de-emphasized with the belief that the meat can stand on its own without adding sauce to it. I think the meat at Tony’s is better with the sauce (on the ribs they already add it and on the brisket you add your own). It is good to know, then, that the sauce has a good flavor. The Chili Beans were excellent with a good flavor that was not over the top in spiciness as I found it to be at Great American. The Potato Salad was a little lacking in flavor but was good. 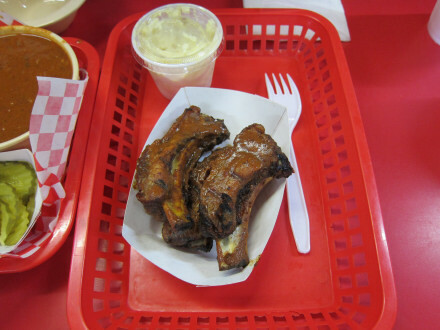 I think great barbecue restaurants should offer a large selection of excellent side dishes, but at Tony’s the sides are limited. I wish they had more sides and desserts such as pudding, cobbler, etc., but I think what they have will satisfy most people. Sweet tea comes from a large jar while the regular tea is refilled at the soda machine. I got the latter and was expecting some sort of commercially produced tea, but I actually really liked what they had. Tony’s is located on a one-way street in an industrial neighborhood, and is not a place people would likely pass by unless they were specifically looking for it. 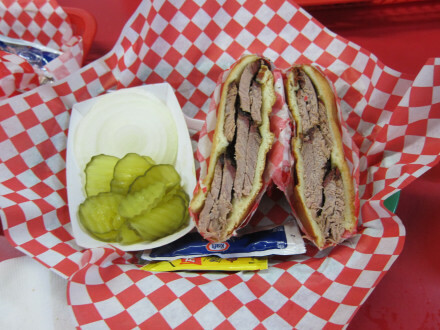 It has very good access to the Interstate, though, and is worth seeking out for a good and inexpensive lunch. Everything here is good, but for me the brisket is one of those special meals that allow me to feel that my blog can really provide a public service by publicizing it. I have read many comments on sites such as Yelp saying that the employees here are quite helpful, and I also feel that this is another reason you will want to come.